I grew up on Doritos and Hamburger Helper. When you are raised by a single dad, food has to be easy. But when I was about 12 I met a family that made everything from scratch and much of what they cooked came from their own garden. I didn’t even know people did that. But it sparked an obsession with scratch cooking and real food. When I first became a mom, I made everything from scratch. I wore myself out baking and cooking and, often times, my attempts were anything but appetizing. Ten years later, I’ve honed my skills and calmed down a little. And now that I am a special needs mom I have even more incentive to keep things real in my cooking but not kill myself with stress over scratch cooking every single thing. Still, as time allows I do as much homemade, non-precessed meals as possible. It’s cheaper and it’s healthier. Life is expensive and, often, life with a special needs child is even more so! Keeping my grocery bill down is no longer a casual pursuit but an absolute necessity. We just can’t buy things that I wish we could keep around. For example, I can rarely buy boxed cereal because it gets inhaled like oxygen in my house full of little men. But it’s so nice to have a quick, easy breakfast available on mornings when I don’t feel like cooking (which, let’s be honest, is most mornings). Enter granola. 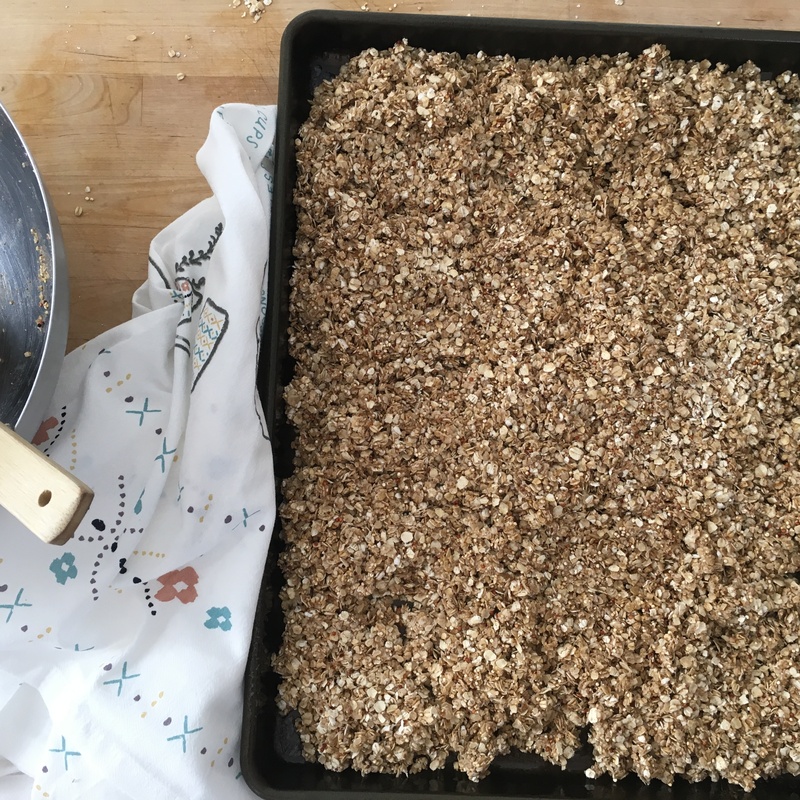 Most of my kids hate oatmeal, which is too bad because it’s basically dirt cheap and sticks to the ribs. So here is the next best thing. 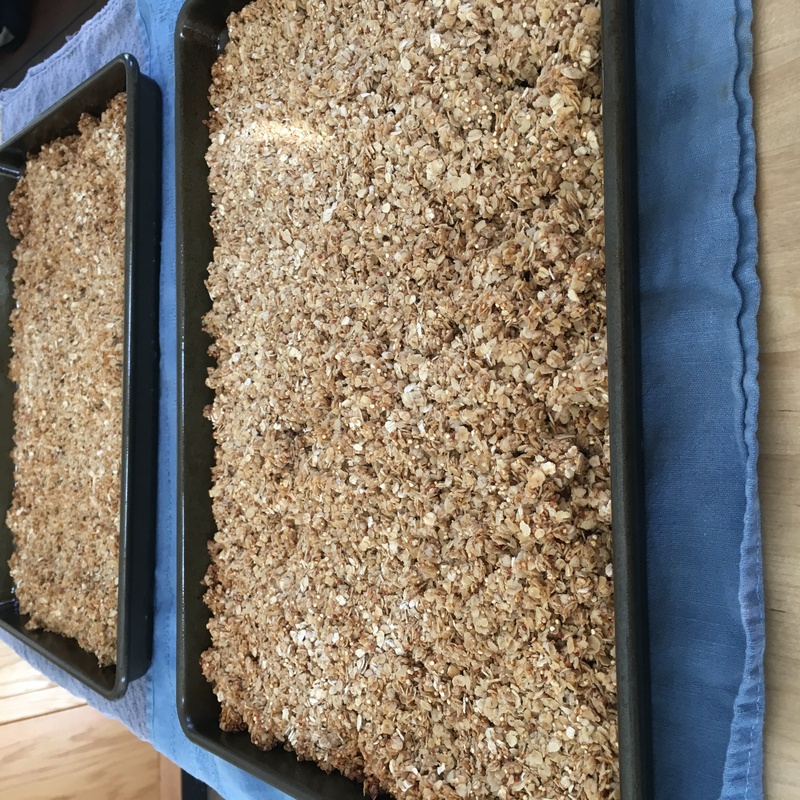 This is my favorite granola recipe, that I have adapted from a book called Family Feasts for $75 a Week by a blogger named Mary Ostyn. Easy and hearty and filling. 1. Preheat oven to 325 degrees F. Grease 3 large baking sheets with nonstick cooking spray. 2. 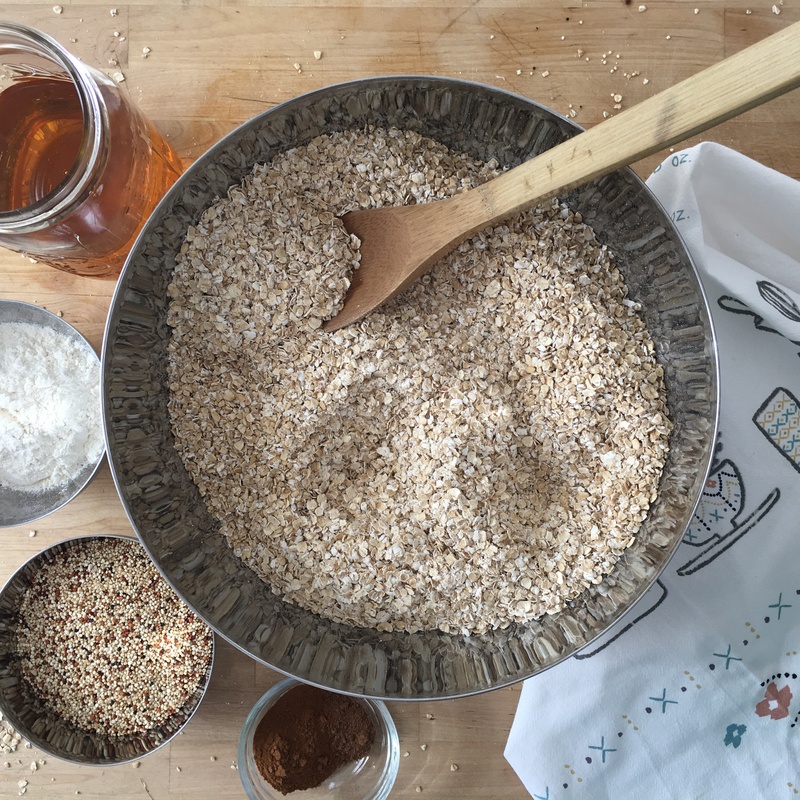 In a very large bowl, combine oats, flour, cinnamon, quinoa, nutmeg, and extra add-ins. Mix well. 3. Combine oil, honey and vanilla in a 2 cup glass measuring cup. Microwave on high 2 to 3 minutes until hot. Pour over dry ingredients and mix well. 4. Spread Mixture over prepared baking sheets; bake until light to medium brown, 15 to 20 minutes. If you ave a convection oven bake all three at the same time. Otherwise, it’s best to bake each pan individually on the center rack of oven. 5. Let granola cool. It will break up somewhat as you transfer it to a storage container, but try to leave some big chunks, as that makes it more interesting to eat. Store in an airtight container up to 4 weeks.